Fall visits to classrooms, full of 3 year olds and 4 year olds. Outside, on the playground, we see a bulldozer/backhoe, working diligently, moving dirt, alongside a road. Preschoolers gather at the playground fence, in awe. "See it push the dirt!" "It is scooping the dirt! Like this!" and she digs her hand into the mulch, "See it has a scoop. Scoop!" Several friends see how right she is, and bend down to scoop the mulch. "Why is it scooping dirt?" I ask. We can't leave the fence. We are immersed in the construction work, entranced. The children look away only to bend down into the mulch and scoop, like the backhoe scoops the dirt. "We have the trucks! It scoops the dirt!" and the preschoolers work to line up all the vehicles. "I am building a house. You can build a house. Are you building a house?" "No, a boat. See, this boat is carrying food down the river." "There are firefighters and police nearby." "Oh, I have a tall house! 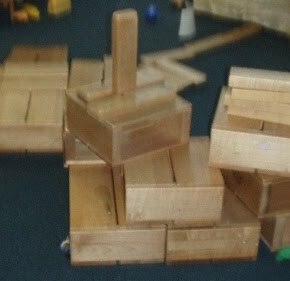 A tall house with slides and jumping places." "Here, at my house, see - sisters, boys, Moms and Dads. We are visiting Grandma, with cake." "What is that noise?," I ask, with a smile, "What's coming?" "Birthday cake delivery, Ms. Maureen! Today is your birthday! Happy birthday to you! ", and they begin singing the song. "Okay, Happy birthday to you! Gotta go, birthday cakes going down the road." Suburban preschools. City preschools. Anywhere USA. Construction outside, construction inside. Building hopes and dreams. What do we expect of teachers? I'm missing my former classroom this morning. I was out for a jog and saw a friend from last year's class, in his carseat, in his Mom's minivan. He waved! I'm on to new things now. I'm mentoring new teachers in DC schools. I am working closely with several teachers, visiting them in their classrooms, observing them in action, being both a support and an energizer. What is it like to be a new preschool teacher? Obviously, I once was one. But, think back about it? Remember and reflect? I think I blocked it out. I think it’s like childbirth, not something anyone seeks to relive, over and over, no matter how beautiful the result. - How to create something out of nothing because your school's furniture order is delayed; how to set up in a much smaller classroom than you had planned; how to re-design the classroom overnight because it never dawned on you that the children might paint the wooden blocks, or that they might dump all the manipulatives and puzzles together while sitting at the table…yes, clearly, you need to rearrange the room RIGHT NOW! - How to lead vibrant, rich, differentiated learning experiences. You will read, write, count, sing, dance, move as the children learn everything! Better yet, you will do this while 1, 2, 3, maybe even 4 children are having total meltdowns in your room. They don’t want to be there! They miss their mommy! They don’t like that book! They don’t like loud stuff! They don’t like! - How to juggle 15-20 different personalities with varying needs and learning differences. How are they best comforted? You must learn this in a snap of your fingers; you have to know and understand them quickly or else, when they fall apart (and they always fall apart), you will have no idea how to help them. You will find yourself really excited when you manage to get all these little ones to line up together to go to the bathroom, but the thrill will be gone when you realize they need to queue up half a dozen times each day. And, if you are lucky enough to work in a full-day program, you will learn how to get them all to sleep at the same time! Extraordinary! - How to establish rules in your classroom and translate them into children's language. You can’t simply type up a list of rules/expectations and say “Here, read this, get back to me if you have any questions.” No, it is far more complicated than this. You need to set up your classroom so that children can see what they should be doing; you need to model and role play how they put things away, how they listen to the teacher, how they ask for help, how they need to treat their friends, how they share toys, on and on. No, unfortunately, you can’t simply hand them a list of your rules. But it is essential that you get these social rules across during the first weeks of school - and that you repeat, repeat, repeat them, all year long. - How to talk to the parents and caregivers. Oh, my, who knew this would be so difficult? It turns out that you have been given responsibility for their most important possession. You must quickly learn how not to be defensive, how to be open to their critiques and questions, how to provide them feedback that makes them feel good about their child, how to encourage them to work with their child, and how to approach them delicately when you are challenged by their child. - How to team with your assistant. You must learn how to work well together, how to anticipate and support one another, as if you’ve been happily married for 20 years. As you find out on Day One, it is really difficult to get 15-20 preschoolers to attend to what you are saying - and it is exponentially more difficult if your assistant is off in an entirely different direction than you. You learn to be incredibly trusting and considerate with someone you've just met. You depend on each other. - How to go it alone but give credit and thanks to everyone. That team of colleagues you thought you had doesn’t have time to help you – they are too busy in their classrooms, with their problems. But, your classroom needs to look like theirs, needs to follow the same routines, have the same "buzz." You must quickly assimilate to the culture and routines of your school, make your classroom look like you've been teaching there for a dozen years, and learn how to impress your principal and others in charge, all on your own (and virtually overnight). Lastly, there's the surprise at realizing - usually mid-way home, hours after your school day has ended - that you have gone the entire day without eating, or using the bathroom. Thankfully, by your second year of teaching, many needed skills are in place: you know how to set up the room and how to create grouping and other organizational systems so that children behave more appropriately; you feel more confident in how you communicate with children, parents, colleagues, and administrators, offsetting many potential problems; and you know the importance of taking care of yourself, everyday, day in, day out. These are just a few of the things I've seen new preschool teachers learn, all at once, in the first few weeks of school. New teachers deserve big, big hugs from one and all! We are so lucky that they take on the challenge! I just finished reading an inspirational book about one elementary school teacher's attempt to change the way she disciplined her students: Learning to Trust: Transforming Difficult Elementary Classrooms Through Developmental Discipline by Marilyn Watson, in collaboration with Laura Ecken. This book is basically a case-study, detailing enormous work by the teacher to create a more collaborative learning environment. I will not attempt to write a synopsis or review of the book, though here is an excellent one from the Harvard Educational Review. Teaching conditions vary greatly across the country and even across a single district. Each person's solution to eliminating or ameliorating any systemic barriers to building nurturing relationships with students will differ. However you manage to do it, increasing your time with your students, leveling with them, and enlisting their support will be keys to your success. In addition, it will be crucial to find supportive colleagues wherever you can, whether in the principal, other teachers, parents, community members, or nearby university faculty. Remember that beliefs about children and their motivations run deep and are often unexamined. We have incorporated deep within us such conflicting messages as "Children are innocent and loving" and "If you give them an inch they'll take a mile." Likewise, many of our emotional and behavioral responses to children are not reasoned but automatic; we become angry or hurt when children violate our trust, and we want to punish them when they defy us or persistently disobey. We are not accustomed to thinking of children as biologically designed to seek adult guidance and care or as having their own particular working models of adults, relationships, and the world. Nor are we accustomed to teaching our students to trust, to regulate their emotions, or to guide their behavior by reflection and self-talk. Adopting a developmental approach to teaching and discipline often involves changing how we think and feel about children, how we interact with them, and what we are trying to teach them. Such profound changes happen slowly, and as they are happening they lead to a good deal of uncertainty, requiring reflection and patience. Allow yourself mistakes; be confident in your goodwill and competence, your ability to reflect on your practice, and your openness to learning from your mistakes. Give yourself time, and be sure to keep your eye on the many successes, both large and small, that happen along the way. As you struggle with the inevitable problems, uncertainties, and setbacks, these successes will provide the most sustaining support of all. Why is exploratory play educational? I ended the summer by going to see the Smithsonian Museum of American History's exhibit Inventions at Play with my friend Marla. This was my second time visiting this fun, on-going exhibit - and it is chock full of wisdom and ideas about how to educate children. The exhibit asks what inspires people to become inventors? Across the board, these creative geniuses noted their creative play when they were young. They learned to invent through hands-on exploring, daring, making messes, testing cause and effect, trying and failing and trying again. Their childhoods were filled with a variety of rich innovative experiences. Many recalled time outside in nature; others mentioned classic toys like Legos and Erector Sets; all noted the value of open-ended, exploratory play. "I don't draw a line between play and work." - Newman Darby, sailboard inventor. Inventions at Play excites me about my own teaching - children need exploratory experiences and I love trying to provide them! This ability to see non-obvious connections and relationships often leads inventors to the key insight that is the basis for their inventions. Isn't it important for children to discover what we do not already know? We have to find a way to make some part of children's learning not about specific answers and data, but instead provide them time and materials to explore non-obvious connections. I think children should have plenty of time engaging in play that has no specific answers, but that allows children to develop skills that are more intangible - such as curiosity, perseverance, extrapolation, reflection, rethinking, scaffolding, and, even, teamwork. Child-development specialists see a strong connection between children's level of pretend play and their ability to think creatively. The exhibit included several hands-on "play" activities for all ages, including one called "Marbles and Motion." Here, a table is raised at one end, so that the surface is slanted. There are a variety of kitchen utensils (classic "toys" from the housekeeping corner of any preschool class) that you use to set up an obstacle course that will help guide the marble to its corner goal. If at first you don't succeed, rearrange the items, position them differently, eliminate some, add another...play until it works. Folks of all ages were participating in this open-ended activity, laughing and talking together - it's not just for preschoolers, though we teachers can recreate it in a moment! (See my attempt in the photo!) This play example illustrates how simple it can be to set up an educational exploratory activity for children. Lastly, I found myself thinking about how we often tamp down on the more creative spirits in our classrooms - trying to get them to be the same as the others. Consider this quote from James McLurkin, robotics inventor: "I was always getting into things. I hoarded broken bits, made messes, build things, burnt up bathrooms." Is there a James McLurkin in your class this year? How will you channel his genius? I have a thrilling new job; I am working as a mentor to several first-year preschool teachers in D.C. These new teachers are filled with ideas and excitement; they have been working tirelessly in their rooms, rearranging and organizing, surrounded by newness - new bins, library books, laminated signs and posters, curriculum books and ideas. They are excited to be a part of a dedicated and energetic staff of educators, working to provide a vibrant and rigorous education to D.C. children. They are ready and imagining what the next week will be like - welcoming and connecting with the children, helping them transition into school, channeling their behavior, encouraging their learning, observing, and reflecting. There is so much to understand so quickly! I visit one new teacher at a school only about 15 miles from the preschool where I have taught for the past many years. "I'm thinking of just leaving them up, to let in all this light. This light is so great. I would love to have it in the classroom. Do you think the children will be distracted by the construction?" "I love the light, too. I think it would be interesting to see if the children are distracted," I start to say. "Oh, it's not about the construction. You have to have the blinds two-thirds down at all times. See, across the parking lot - just next to you? - that housing? S.W.A.T. teams come there regularly. This is about drugs. When they come, you have to close the blinds, to avert the children's attention. Of course, many of the children come from that housing, but they are often numb to these emergencies. You can keep the blinds open most of the time, but you must be ready to close them when a situation happens." The new teacher and I look at each other, with our eyes wide open.